Hmm, Blaster skill instead of Repair then. Then shopkeepers not repairing blasters would be ok, because Blaster can be learned to GM by anybody, unlike Repair Item. Yes that is even better than my first suggestion, because if both skills are needed you have to choose a class that can be grandmaster of repairing. In your version everybody could be able to repair a blaster, he/she just needs to be on a higher blaster skill level. Anubis wrote: Bug: In the room with Agar @ Agar's Laboratory, only the character in the first slot is able to interact with Agar's Cauldron/Agar's Pile of Skulls even if your other characters are selected. If not cursed, the cauldron/pile of skulls kills you. If cursed, the cauldron/pile of skulls grants you +50 intellect each time. I imagine not a lot people knew about this secret which is why this was overlooked. Xfing wrote: A little issue to report: I found a War Axe (MM6) in one of the chests in the Harmondale wilderness. It's the best Tier 3 axe. Not sure if it was ever possible for a treasure of that level to appear in these particular chests. I recall having a similar problem with finding a Regnan Cutlass from MM6 (also tier 3) on Emerald Island, and in one update this was mentioned to be fixed. Is this a new feature to add some excitement to the game (a small chance to find treasures beyond the chest's level), or something unintended? anyone knows if there is something special with the black barrels at the dwarven mine (castle ironfist)? Last edited by justl on Apr 15 2019, 16:58, edited 1 time in total. Could one of you write it to the Suggestion Tracker in some cohesive manner? Even anonymous users can edit stuff on the tracker, it works like a suggestion, and I have to apply the changes made (or decline them). We had a few grievers on the Tracker that suggested nonsensical stuff, like changing Troll Paperdoll to Trolls Paperdoll (without an apostrophe!). Just a BTW. also in the wolf lair. Last edited by justl on Apr 15 2019, 19:55, edited 1 time in total. What was the perception of the character that used the skullpile of death? I'm a newbie to this project so I hope you will excuse my arrogant questions & suggestions... So, I've just tried out the latest (06.04.2019) version of MM6-7-8 Merge after countless hours in MM6, MM7 and MM8 many, many years ago. 1. Why is the class system so inconsistent? Do we really need MM8-specific classes like Necromancers and Priests as long as we have the Sorcerers and Clerics from MM7? How does the two-stage promotion system and the choice between Light and Dark found in MM7 even work with these MM8 classes, Necromancer being clearly a 'Dark' class and Priest being a 'Light' class? These classes are superfluous and should be removed for the sake of elegance and integrity. 2. Why Jadame and Antagarich races are unavailable in Enroth? Could this be activated with some option? I would love to begin the game in Enroth but have trolls / vampires / minotaurs in my party. 3. Why some MM7 classes like Monk are unavailable in Enroth? 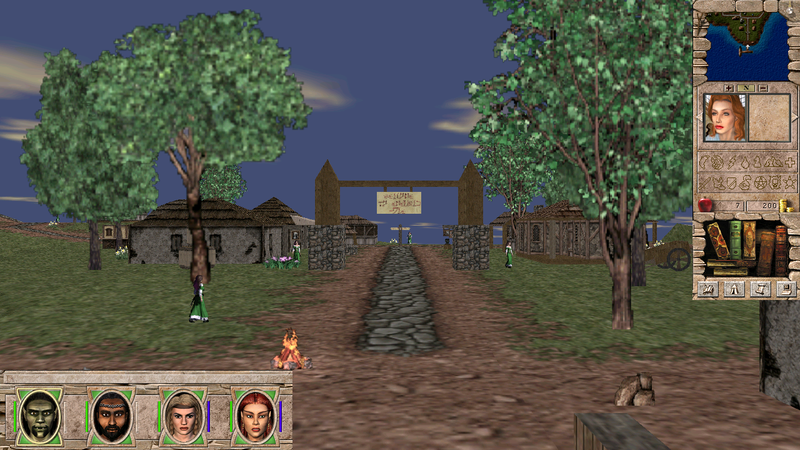 If the appropriate promotion quests / trainers are only available in Antagarich, why not just travel there if you consciously chose a Monk for your starting party in Enroth. Same goes to Jadame's Vampires and Trolls. 3. Speaking of Vampires and Trolls, they seem to be two pretty self-contained societies whose 'professions' are tightly linked with their lifestyle, physiology and traditions. So it stands to reason they only have one class, Vampire and Troll accordingly -- but I would rather call those race-specific classes Nightstalker and Barbarian, just to make some distinction between Race and Class -- again for the sake of integrity and keeping with the MM7 tradition. So that Trolls are limited to the Barbarian class and Vampires to the Nightstalker class -- a purely cosmethical change. 4. The Vampire Ability skill, though, seems to be unbalanced and too weak as long as we have all the MM7 classes available. Okay, Life Drain is unique and makes sense. I could understand Levitate -- unlike Water Walking, it also helps avoiding traps and lava... but it still looks too weak as opposed to the perks granted by other skills at Expert level. Could Levitate maybe increase the party's max travel distance per turn in turn-based combat, like maybe for an extra 20%-25%... and also give a similar speed boost to real time travel and especially to the strafe speed. Finally the Mist Form gained at Grandmaster Vampire Ability is cool but not universally useful, not even close to the overall usefullness of other Grandmaster abilities. But somehow I like Mist Form the way it is... I think Grandmaster Vampire (along with Master and Expert) could become balanced with the rest of the skills if the basic Vampire ability, that is Life Drain, would restore the exact same amount of HP that is stolen from the victim, not a measly 1/3. This would imbue Expert, Master and Grandmaster Vampire Ability skills with a lot more sense since they boost the recovery time and the damage of that basic ability. 5. Minotaurs... The Minotaur class from MM8 is nothing special, there's no reason why Minotaurs should only stick with one profession. Currently the MM6-7-8 Merge has Minotaur class available if you start in Jadame but only the basic MM7 classes if you pick a Minotaur in Antagarich, how come? It looks reasonable (at least to my mind) that the Minotaur class should go, being superfluous, and Minotaurs should get access to the same classes that Humans, Elves, Goblins and Dwarves get. Or maybe Minotaurs should be restricted from picking classes that end up as Master and Grandmaster spellcasters... but nothing more than that. The Minotaurs' inability to use boots and helmets should be balanced by giving them a special ability... like maybe getting +1 Hit point per level added to the base HP per level modifier of ANY class they pick and a permanent starting bonus of +10 to Mind, Spirit and Body resistances due to their powerful physique? Not being able to wear boots or helmets becomes a big nuisance in late game when very powerful items become available, giving much more than just the bare Armor Class they have. 6. Dark Elves. Their Dark Elf Ability looks very cheesy and inconsistent as compared to other racial abilities like Vampire Ability, Dragon Ability or Regeneration. Why don't the regular Elves, Dwarves, Goblins and Humans get random spell-like abilities when Dark Elves have them? The choice of Dark Elf 'spells' gained at different Dark Elf Ability mastery levels looks kind of random and far fetched. I'd suggest making Dark Elves a regular race like Humans, etc., without any class restrictions or special abilities -- the only difference being the unique choice of 'weak' and 'strong' stats at character creation, the current selection being Accuracy and Endurance. 7. Dark Path vs. Light Path for MM8 races. This has to be in the game, with the two alternate second tier promotions and all. Vampires turned to Light should change their class to 'Goody-Two-Fangs' after the 2nd promotion, with lots of hilarious dialogue options and tongue-in-cheek humour. Since Vampires don't deal with Dark or Light Magic at all, and have no real alignment affinity, this kind of character seems possible to me in the Might & Magic universe. I mean, vampirism appears to be something purely physiological (if 'physiology' is a proper word for an undead creature) and being evil is merely a popular choice among Vampires, but in no way an absolute imperative. We could have evil Paladins in MM7, remember? 8. 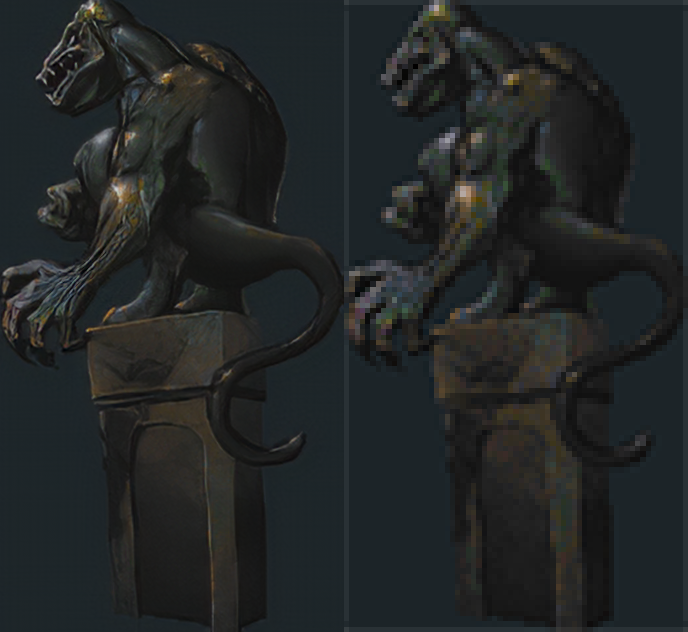 These days, everybody's so big on sprite upscaling with neural networks. How come nobody tried Gigapixel AI or at least ESRGAN with the amazing Manga109Attempt dataset on Might & Magic sprites? 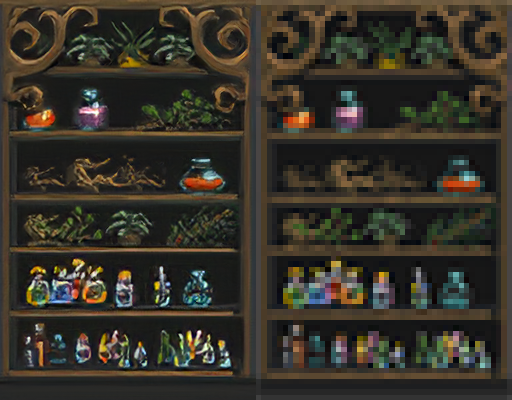 Look how beautifully these tiny sprites from Daggerfall can be upscaled through pure AI and without human intervention... Might & Magic sprites are so much bigger than Daggerfall's, so you'd be getting a ton more quality if you try AI-upscaling on those! Setting StretchWidth and StretchHeight to default fixes this, but I'm getting black bars and the whole thing goes 1440x1080! 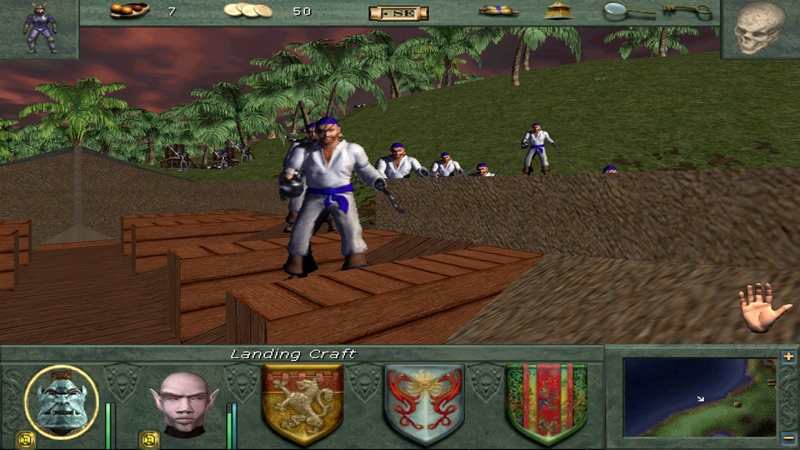 Is there a way for getting a 4:3 scaled UI on top of a 16:9 scaled 3D viewport? 10. Most likely this belongs to Dege's domain but I still feel like asking here: is there a dgVoodoo.conf / mm8.ini tweak that would scale the UI using bicubic / superSAI / xbrz or any other filter? 11. This project has many threads and pages at different places... but none of them explain how the plots of MM6, MM7 and MM8 are linked to each other in this mod? I see how the Kreegans crashing into Enroth in MM6 can be followed by Escaton's immediate advent in MM8, but linking the MM7 story to Archibald getting free from his stone curse at the end of MM6 is a bit trickier. How does this mod account for the very special events in MM7 that ultimately result in the party picking either Light or Dark side? 12. Given the same ole five-guy team for the whole playthrough while three times as much content as in a single M&M title, is there a trick implemented to keep the party from leveling up too fast while not reducing the progression to a clog? 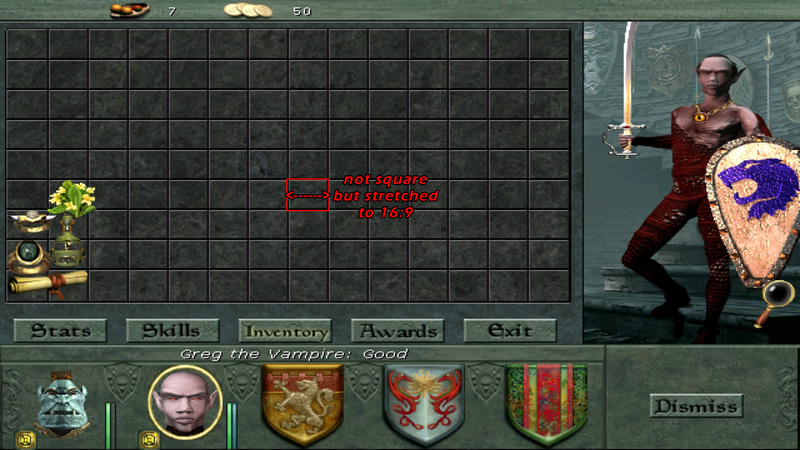 I'd suggest using the 'killing monsters of a much lower level than you yields you almost no XP' mechanic that Baldur's Gate used, but maybe it's already implemented? Long ago when I played vanilla MM6, MM7 and MM8, I used to spend lots of time wreaking genocide upon the hordes of surface-dwelling mobs just for the sake of gaining XP. With the MM6-7-8 Merge, I feel pretty well off with simply finishing quest dungeons, there's always enough monsters and no need for thorough and intended monster extermination in the wilderness. I suppose that's how the MM6-7-8 should in fact be played. So to keep the player from leveling up too fast (and also to keep them from mindless 'farming') it would be cool to severely cut the XP gains from any slain monsters that are much weaker (i.e. have a much lower level) than your party. Like, there's a lot of goblins and rats in the quest dungeons ahead, you don't need to farm them for XP -- you'll face plenty of them anyways. You should be looking for stronger and stronger monsters to vanquish, because if you keep farming rats and goblins to get more powerful, you'll end up getting very little XP from those easy kills. So only kill for finishing quests, and seek enemies more powerful than you. Travel between Jadame, Enroth and Antagarich to find those; there are plenty of quests on the three continents, level up finishing those instead of exterminating all life in every location. TL;DR: Leveling should be consistent with the 3X amount of events and monsters in this mod, keeping the player from getting much XP from easy kills seems like a viable option. P.S. I sincerely hope I didn't offend anyone reading this. And thank you for this wonderful mod! Last edited by Waldemar on Apr 16 2019, 1:07, edited 6 times in total. Hi, I have a question about the new class system. I started the game in Jadame an I got with me a Peasant. Now I found several teachers that learn "Knight", "Sorcerer", "Druid", "Cleric" etc. I also found a trainer for Vampire and Dark Elf, both could not be learned by my Dwarf Peasant. Anyway, I didn't found a Teacher for Necromancer or Priest. So I wonder, can Peasants only learn Default classes (like the ones from mm6 oder mm7) and not the specialized classes from 8? - Or haven't I just not found those trainers yet? vegetableharry wrote: Hi, I have a question about the new class system. I started the game in Jadame an I got with me a Peasant. Now I found several teachers that learn "Knight", "Sorcerer", "Druid", "Cleric" etc. I also found a trainer for Vampire and Dark Elf, both could not be learned by my Dwarf Peasant. GrayFace wrote: Hmm, Blaster skill instead of Repair then. Then shopkeepers not repairing blasters would be ok, because Blaster can be learned to GM by anybody, unlike Repair Item. Waldemar wrote: 8. 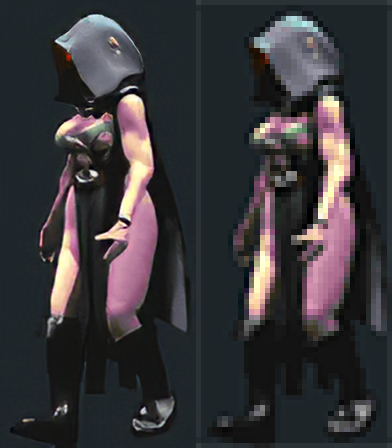 These days, everybody's so big on sprite upscaling with neural networks. How come nobody tried Gigapixel AI or at least ESRGAN with the amazing Manga109Attempt dataset on Might & Magic sprites? The author of the latest MM in Unreal project was doing some work with one of the tools. He had to do some manual work, because the tool didn't preserve tiling. Waldemar wrote: Is there a way for getting a 4:3 scaled UI on top of a 16:9 scaled 3D viewport? Waldemar wrote: 10. Most likely this belongs to Dege's domain but I still feel like asking here: is there a dgVoodoo.conf / mm8.ini tweak that would scale the UI using bicubic / superSAI / xbrz or any other filter? By the looks of it, that's the scaling of my patch. My patch totally bypasses dgVoodoo unless you disable SupportTrueColor option. 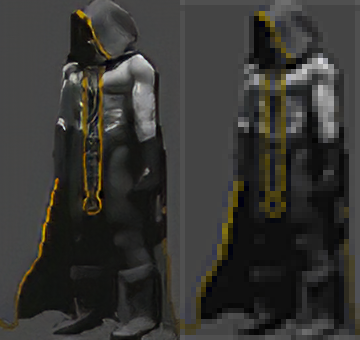 dgVoodoo does some typical D3D scaling (maybe bi-cubic), which looks too blurry for text. Pixelart scaling algorithms are a good fit, although I don't know if any of them supports transparent color and arbitrary scaling instead of 2x/4x/8x. You can also try lowering ScalingParam1 and ScalingParam2 in INI. Last edited by GrayFace on Apr 16 2019, 11:31, edited 5 times in total. 1. There is some balancing done, also you can be promoted in a rather complex mishmash manner between Enrothian, Jadamean and Antagarich classes. Also there are a few new classes. 3. No, it isn't purely cosmetic, and you don't have a say in that. Feel free to rename classes to whatever you wish, it's in the .txt tables, but do not force your purely subjective opinions on others as rules. 7. No, it doesn't have to be in the game. 8. That's ... kinda awesome. Using better graphics is something that GrayFace is working on currently, but as far as I know, it isn't ready yet. So they are texture size limits and such. 12. There is enemy bolstering based on your progress and whatever. Also you can switch the parties if you wish (some people do that, I wouldn't). Enemies get stronger, but do not yield better EXP. Last edited by Templayer on Apr 16 2019, 15:45, edited 1 time in total. That would be enough in vanilla MM6 I think, but since that doesn't have GM and the death variation of skullpiles is the highest tier I think (or is it? I do not remember), try having 12 and GM. I haven't played for a few months, but I think that in vanilla MM6, my archer could use those skullpiles of death without ever dying at master perception. I have just opened it in anonymous mode, so I am not logged in, and just clicking anywhere in the Tracker tells me through the cursor that I am suggesting edits. Easy as that. Just open the tracker, and type anything you want anywhere you want. I won't apply your changes unless they make sense, of course. Anybody can edit! Last edited by Templayer on Apr 16 2019, 15:46, edited 1 time in total. That doesn't answer my question though. Are there Necromancer or Priest teachers in the game, or not? Last edited by vegetableharry on Apr 16 2019, 20:44, edited 1 time in total. I hope the picture shows up, yes I know there was white around the pic. My bad. But these Boots look finished, just swap left to right and right to left and put at bottom and should be fitting nicely. Templayer wrote: I have just opened it in anonymous mode, so I am not logged in, and just clicking anywhere in the Tracker tells me through the cursor that I am suggesting edits. Easy as that. Just open the tracker, and type anything you want anywhere you want. I won't apply your changes unless they make sense, of course. Anybody can edit! Hi Mate, I tried to add something to the suggestion-tracker, but unfortunately I didnt find it... I added two suggestions to the "missing features-list". Can you move them to the right section please? Just wondering is it possible to have the Mercs update everyday ingame ? Everyday a new Merc ? MM8 is still divided into race and class, even vanilla, in vanilla though, characters are for example race: Dark Elf and class: Dark Elf. Racial classes logically cannot be attained this way. You can be promoted to a Necromancer and Priest I believe. I'm pretty sure about the necromancer. What... what is it for? Is it a repaint for one of the paperdoll types? Dude, the Suggestion section was literally on THE NEXT PAGE under the place you've put it.